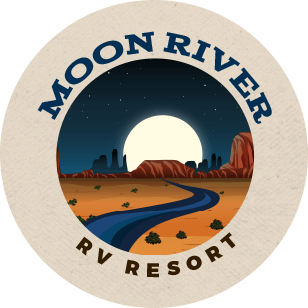 Every site at Moon River RV Resort offers 20/30/50-amp full hook-ups. Rates include water, sewer and trash disposal. Daily & Weekly rates include electric. All other rates, electricity is billed separately. All rates based on double occupancy. Additional fees apply for extra guests. $350.00 + electricRates include 2 guests. Additional guests are extra. $30/month per child (under age 14). On-Site RVs are available for rent. Call us at (928)-788-MOON or email us for current rates. All rates are based on double occupancy. Additional occupants will incur additional charges. Telephone service available on selected sites. All rents are consecutive usage, non-refundable, non-refundable for early departure and are non-transferrable. Save $50 for every referral who stays for a minimum of 3 months! Refer 2, save $100! Refer 3? Well… you get the idea! Call us at (928) 788-MOON (6666) or email us for more information! Cancellations made prior to scheduled check-in are subject to one (1) night reservation fee. Cancellations within 72 hours prior to arrival are completely non-refundable. Deposits in the amount of $100.00 are subject to fifty dollars ($50) fee, if cancellation is made more than 30 days prior to arrival date and in writing. Cancellations made within 30 days of arrival are non-refundable. Deposit refund requests must be signed in the office before departure. All refunds will be mailed by Company Check or credited to guest’s credit card.